Next Gen Dine by Prelag Partners LLC integrates a video overlay for transactions on point of sale to surveillance video. 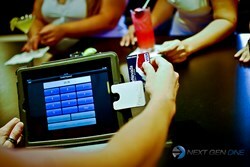 Next Gen Dine by Prelag Partners LLC integrates video overlay from point of sale transactions onto surveillance video. This new feature displays the customer’s order directly on the surveillance video. The video overlay is an added security feature that is now available for Next Gen Dine restaurant point of sale users. The video overlay feature helps managers keep track of sales and improve the establishment. Next Gen Dine is the future of restaurant dining. For more information about the product or to find out how your restaurant can take part of Next Gen Dine, contact Paul Roberts, Managing Partner, at 1-877-342-2218 or paul(at)nextgendine(dot)com. Connect with us on Twitter, Facebook and LinkedIn.